How can the electric pole No. 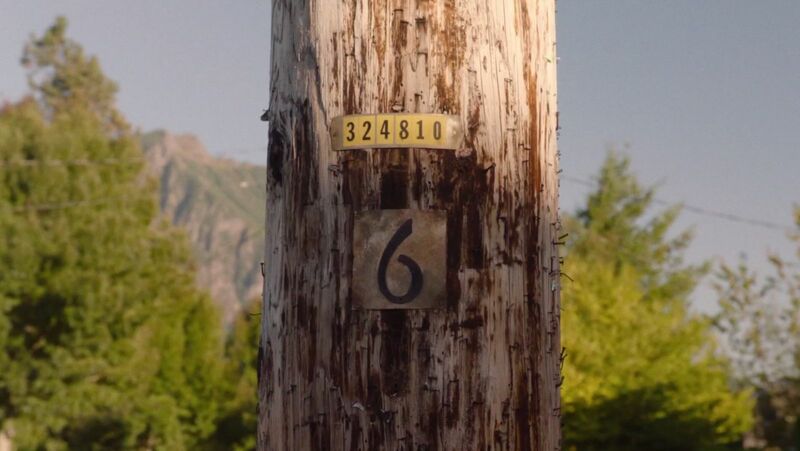 6 be in Twin peaks? AND even though we don't take account of the book, the NEW Fat Trout can be a stretched script device to put Carl in TP, but even though I "accept" that, you CAN move a trailer park, you definitely CANT move an electric pole with you. 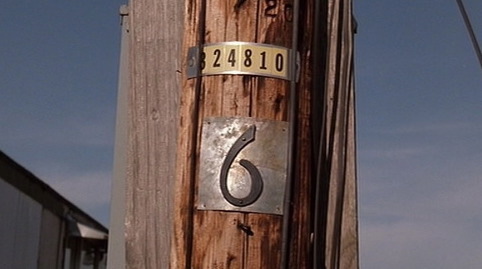 In FWWM Fat Trout Trailer Park was placed in Deer Meadows (doppelganger town to Twin Peaks). Aren't TP and DM like neighbor towns? I don't think Carl lives in TP or that the Trailer Park was moved. I think it was all the same as FWWM. Need to rewatch though. In FWWM Deer Meadow was in Oregon. Well aren't Oregon and Washington neighbor states? I mean, they could be very close by the state line, right? Remember that the description of TP's location in the TV Show makes no real sense of location. Laura, Ronnette and Teresa were friends, Leland used to go there often. I don't know, I always assumed they were really close to each other. Isn't Twin Peaks close to the Canadian border? "The geography is confusing, perhaps deliberately so; Cooper says in the Pilot that Teresa Banks' body was found "in a town in the Southwest corner of this state", where Twin Peaks is in the Northwest corner ("...five miles south of the Canadian border, twelve miles west of the state line"). This is consistent with Chester Desmond flying into Portland, Oregon in Fire Walk with Me. However, The Secret History of Twin Peaks, while affirming that Deer Meadow is in Washington, also says that Deer Meadow is "one county to the west" of Twin Peaks, calling it a "nearby community". Changes in the script, it seems. Twin Peaks is located in northEAST corner of Washington state, by the Canada and Idaho borders (something the "Secret History" book got wrong on the dust jacket flap, which said northWEST... the show was filmed there, true, west of the Cascades near Seattle but the fictional town lies just north of lovely ol' Spokane). So, nowhere near Oregon. The description given in the show is impossible. The fact that the body of Teresa was found in the state of Washington, though, reinforces the theory that the towns are nearby. That just makes is more confusing! 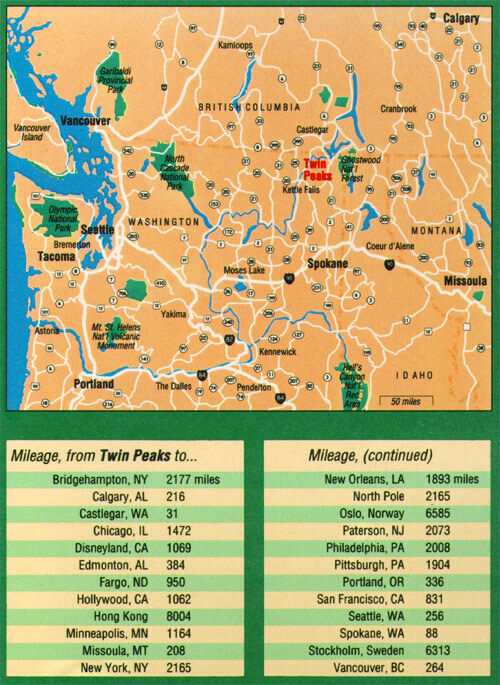 Twin Peaks is supposed to be set in the North Eastern area of WA state. This is quite far away from anywhere in OR. In FWWM, Deer Meadow was in Oregon or just across the WA/OR border. Lynch plays very fast and loose with geography, that's for sure. I always thought of Deer Meadow as a nearby town, somewhere south of Twin Peaks. Otherwise events in FWWM aren't in canon, and Lynch specifically said FWWM was important to The Return, so I think those events still matter. Buckhorn, South Dakota is fictional, but on the map, it's basically right where Sturgis (hope of the annual Sturgis Motorcycle Rally) would be. All our prisons in SD are east of there, several hours away, yet Agent Preston says Evil Cooper was heading west when he crashed. Sturgis is only 40 miles from the state line to Wyoming, so how Evil Cooper ends up in Yankton, a prison 381 miles away, and in the opposite direction, the next day is up for debate. Like I said, Lynch plays very fast and loose with geography.